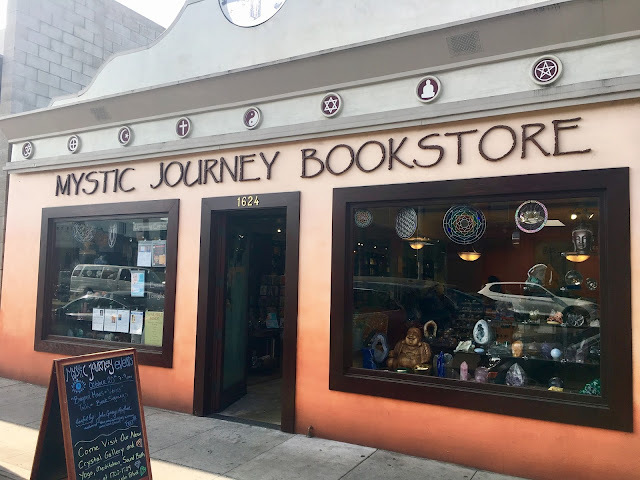 Mystic Journey is exactly the kind of store you want in Venice ... psychic readers, incense, tarot cards, chimes, books, crystals - all the groovy stuff any good hippie needs. 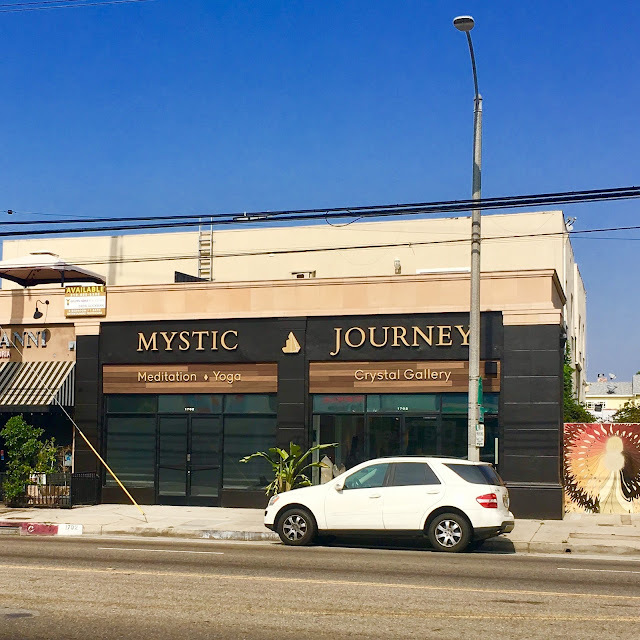 It's also the rare indie success story on Abbot Kinney, where instead of being driven off of the block, Mystic Journey has actually expanded, and now has its second, enhanced Mystic Journey Crystal Gallery and Event Space on Lincoln Boulevard. They've been on my list to write about since their original location opened further down on Abbot Kinney next to Principessa, and I finally tracked down owner, Jeff Segal, to hear his story just in time for his 9th anniversary today of opening shop on October 24th, 2008. 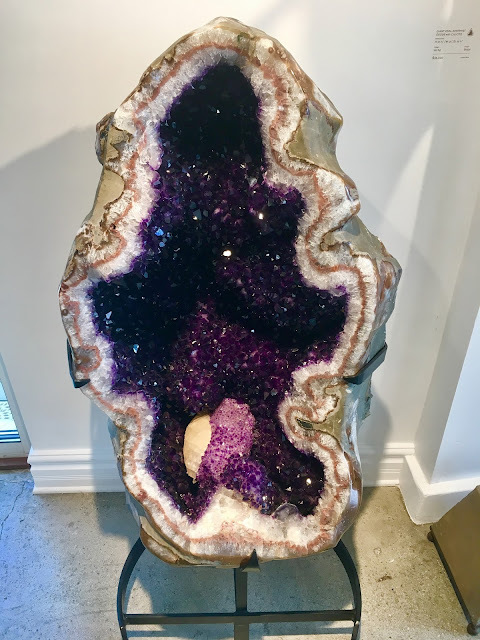 We sat down to chat in the Amethyst Room (the "stone of peace") at the Lincoln location, so called because of the purple couches and beautiful, gigantic amethyst geodes set up around the room. 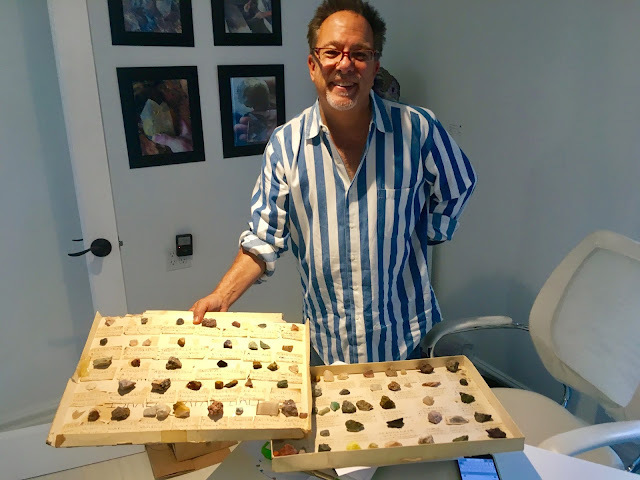 Segal was raised in California, and was a fan of collecting rocks and crystals from a young age, even showing me his labeled collection that he assembled at eight years old. "I guess it was always in my blood," he explained. Segal attended Occidental College, which led to law school in D.C., but three years in the east coast cold soon led him back to Los Angeles, where he practiced environmental law for 27 years. The stress of that job suing corporate polluters made him grow disenchanted with it all, he wasn't digging it, and knew he'd get sick if he didn't get out of it. And he did. He was diagnosed with testicular cancer, and after listening to his gut, decided against undergoing chemotherapy, and instead assembled a team of alternative healers. His best friend was his doctor and advised against that route, so they made a deal that if in three months there was no improvement, Segal would go the more traditional cancer route. Well, the acupuncture, Pranic healer, body workers, therapists, and everything else he tried, worked. The cancer had shrunk by 50 percent. Another three months, and there was no more sign of any abnormality. The cancer was gone, and beating it caused Segal to dig deep. These events made him realize that the important things were not material. He gave much thought to what he wanted to do with the rest of his life, and asked himself, "What do I REALLY want? What am I most passionate about? And that was my spirituality." There was no equivalent to The Bodhi Tree or The Psychic Eye bookstores on the west side, so Segal set out to create a spiritual haven for people on this side of town. "It was Abbot Kinney or bust," Segal told me, and though he had no retail experience, he found a cool landlord (! ), and opened the original Mystic Journey on October 24, 2008 - just as the economic crash was about to happen. The interesting thing was that as all kinds of other businesses were suffering in that climate, Mystic Journey only grew. 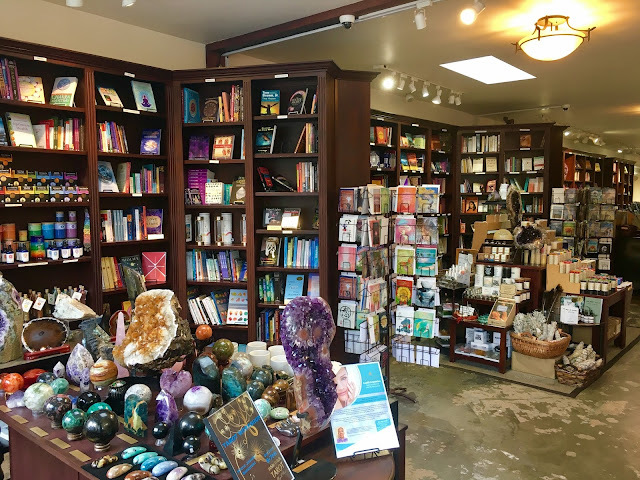 When finances are difficult, people often turn more within, and since Mystic Journey offered everything you could ever want for your spiritual journey, the store actually thrived. In addition to offering the products that customers would want to purchase, Segal also wanted to help people learn. 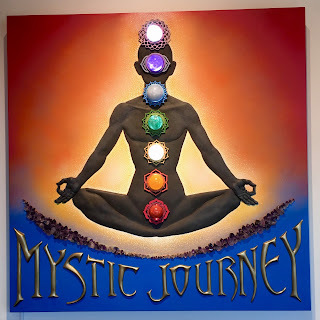 To that end, Mystic Journey offers classes, workshops, speakers, psychics, astrologers, and teachers to help all find their way on their own spiritual journey. After five years in the original location, Segal felt it was time to grow - and his lease was up. He looked all around, but wasn't going anywhere other than Abbot Kinney. He had a great deal, which fell through at the last minute - and the lone hold-out on the deal was the surgeon that had operated on Segal's cancer! Weird. Even that setback worked out in Segal's favor, as the current space opened up just then, and Segal considers it the best space on the street. Segal is aware of all the change on Abbot Kinney, but told me, "We'll continue to do well on Abbot Kinney because we present something that isn't otherwise here. We're unique." Which is exactly what we love about them, and what tourists want to see when they come to Venice - not corporate chain stores. "All I want is for whomever comes to be successful," Segal graciously said, adding, "Negative energy toward whatever business is not a good use of my time or energy. I'm here to be of service and to help people, and all of my energy has to go toward that." 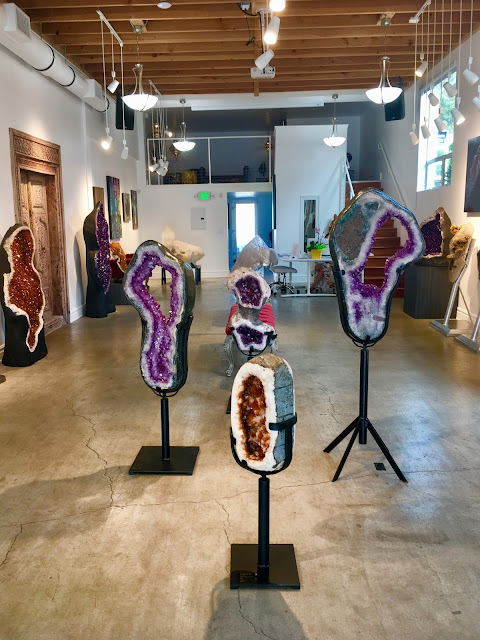 He has also made it so there is always something affordable on Abbot Kinney - "You can get a $30,000 large geode, or a $3.00 impactful stone." - Plus cards, candles, and a whole slew of things that won't set you that far back, but will absolutely bring the positivity. Whatever helps in these crazy, largely negative times. It really is time to go within and try to figure out what you really want, and go in that direction, because time doesn't feel as infinite as it once did. And Mystic Journey can help you. And Segal has a lot of energy. 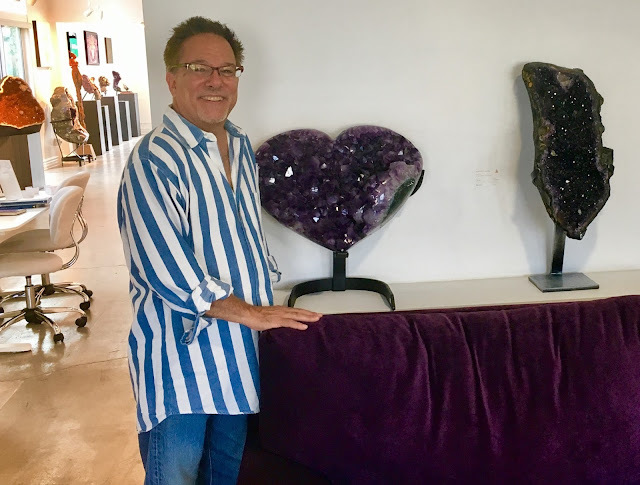 He has to, as when he started having thoughts about expanding to be able to display his larger crystals and offer larger classes, the Lincoln Boulevard space that previously housed Venice Arts came to him. 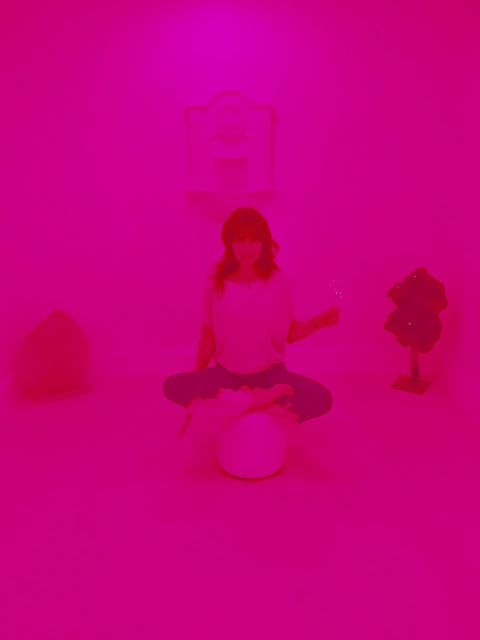 They needed a bigger place to work out of, and once Segal saw their Lincoln space, he knew it was the spot to house his giant crystals, hold yoga and meditation classes, and even added a sound bath and color energy room (led by Jenny Deveau, Mystic Journey's woman of all trades). 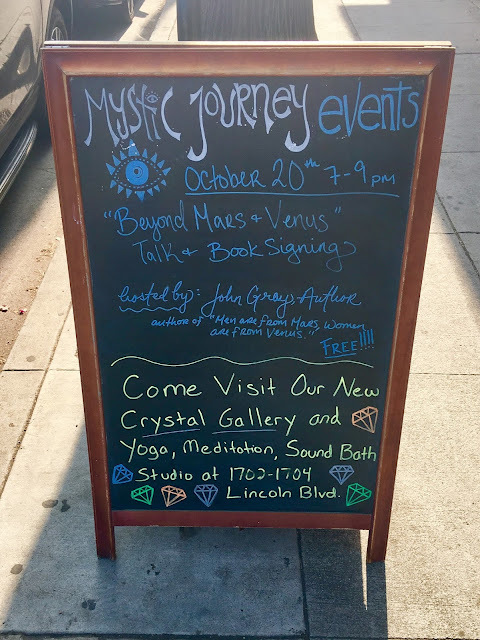 They've already hosted such events as a Dan Millman (Way Of The Peaceful Warrior) reading, CD release parties, and Sound Bath Friday Nights, among many others. It's a wonderful vibe, and the crystal gallery/event space is something else. Segal's childhood rock collecting led him to learn about and acquire some of the most gorgeous specimens of crystals I've ever seen. 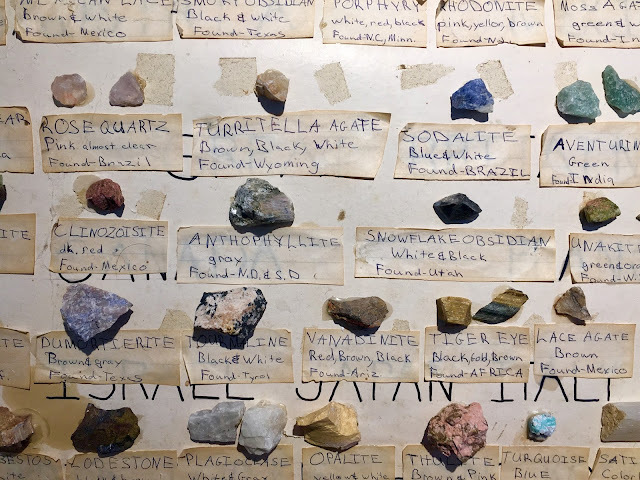 After attending gem shows around the country, especially the big one held in Tuscon, Arizona each year, Segal made friendships with the gem dealers, and soon found himself traveling to the mines in Uruguay and Brazil to experience the origin of these precious gems. 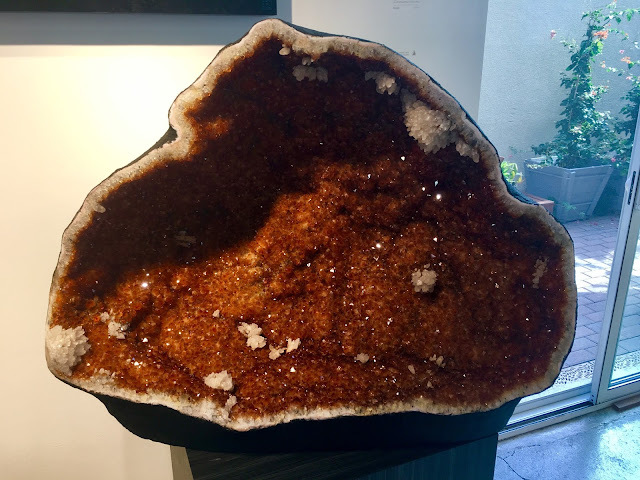 "Crystals are natural art. They're created by God, or the Universe, and the force of Earth. You can feel the energy that they emanate, and it can really be emotional." When Segal's Pranic healer would wave a crystal wand over him, his body would begin to vibrate. "There's more than just the physical universe. I fully believe that there is a higher energy that people can tap into if they're open to it. You have to follow your intuition to take the right steps." Segal is big on intuition, and it has served him well. When he thought about where he wanted to open his new business, he waited to feel what resonated with him - a word that he feels is not used enough. Things have to resonate with him, and it's good advice to follow. Things should resonate with you, which is basically the same deal as following your intuition. Things should feel right. For Segal, that means being near the ocean. "My energy loves the ocean. It's the place of balance on the Earth. It's my peace." Segal wanted a single digit address (because that meant it was closest to the water) and a space for his business on Abbot Kinney, and he manifested both. He loves Abbot Kinney and Venice, because "You'll see every color, hear every language, and it's a true place for people to mix and interact, and everyone accepts everyone else - that's the beauty of Venice to me. The most important thing in the world now is tolerance." Segal explained things to me like, "There's the center of the Universe, and everything else is spokes coming out of different ways to get there. You do whatever is right for you." And Mystic Journey has pretty much all of the spokes to lead you in the right direction. 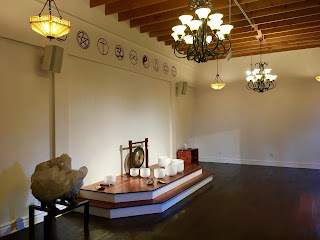 Segal loves the community of Venice, and loves seeing its members at places like Wabi Sabi and Hal's, and of course, when they come into either Mystic Journey location. 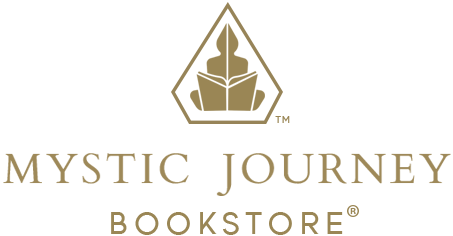 "Mystic Journey Gallery and Yoga Studio is an extension of the book store, but more than that, it's a transformational center. The crystals are awe-inspiring. They have an energy that is truly moving. I'd like to see them in hospitals, law offices, hotels, any public space that would allow people to feel their energy. There are energetic modalities for people to experience and grow from. It's truly a unique space, that I believe is unduplicated in the world." Lucky for Venice. 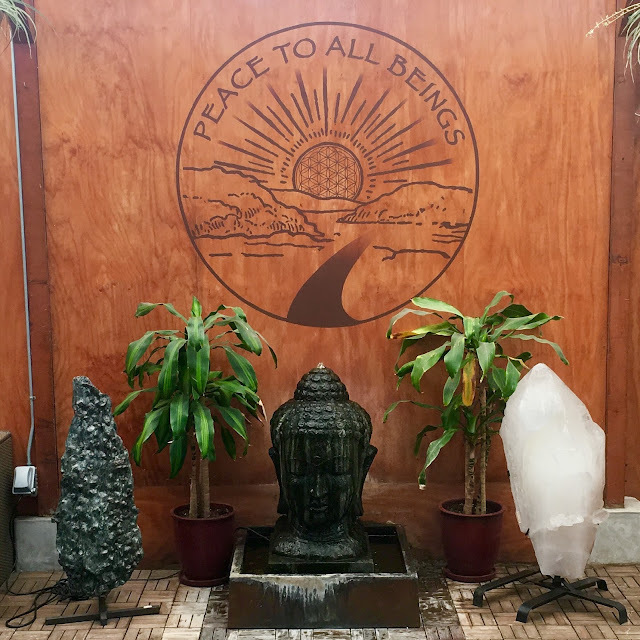 Both Mystic Journey locations are open every day, to bring as their motto says ...Peace to all Beings.